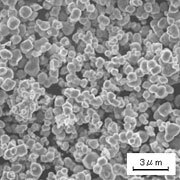 Tungsten Powder｜JAPAN NEW METALS CO., LTD.
Also it has the highest melting point (approximately 3,410℃) of all metals. Tungsten is very stable element, which does not oxidize in air. It has outstanding corrosion resistance, thermal conductivity and electric conductivity. The characterictic of this product is that it has a purity of 99.9 percent tungsten with high density, a high melting point and high conductivity. Cemented carbide tools, medical equipment and radiation sheilding. 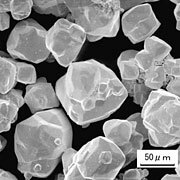 Uniform particle type tungsten powder has extremely narrow particle size distribution in comparison to a conventional type with same FSSS particle. 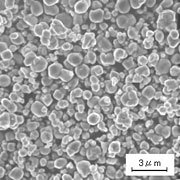 Single particle type tungsten powder is composed of only primary particles with very few secondary ones. In paticular, the powders with about 1.0 - 3.0um particle, its particle size distribution is remarkably narrow. 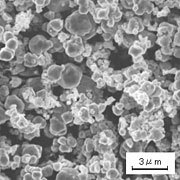 Metalization, particle dispersed composites and high-density components. Screening mesh size is adopted to W-S.
（*5）Tungsten powder is a restricted item by Japan's export control regulation.